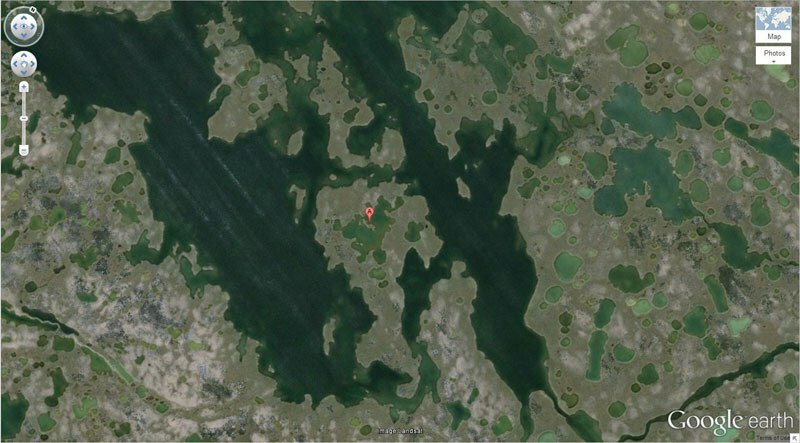 Ever seen an island in a lake in an island in a lake? This unusual combination exists, and you can go check it out. I included a map above for you to find it. Go ahead, I’ll wait. Did you find it? Chances are, the “map” I gave you wasn’t very useful. It showed the picture of the feature I wanted you to see, but didn’t include any context as to where it is at in the bigger picture. Nor did it include any sense of direction to know how you can get from where you are to where it’s at. If instead I gave you a link to the Google Map of it, you could then zoom out to understand the context, and plot where it was in relation to where you are. We often operate as businesses with similar types of limited context. We have a feature that sounds great, but no sense of how we get there, or whether that would be the right thing to do with what we have. For example, if you are in Europe, you’ll need an airplane (or at least a boat!) to see that particular island. But if all you have is a bicycle, then you might want to look for something a little more accessible. A couple of years ago I gave a talk about figuring out what things a business should go after. It started with the notion of mapping the landscape and what options were available – known as Wardley Mapping. The basics are that you start with the needs of the situation, visualize the components needed to meet those needs, and then map out how those components evolve to understand what “plays” you can make. Let’s say our CEO wanted to get into the “Internet of Things” space starting with a device that lets people measure the weather and automatically report it back (We’re leaving out the process we used to come to wanting to do this, which in most businesses amounts to basically throwing darts). We’re supposed to start with user needs, but since “IoT Device that Measures Weather” is our charter, let’s start there. 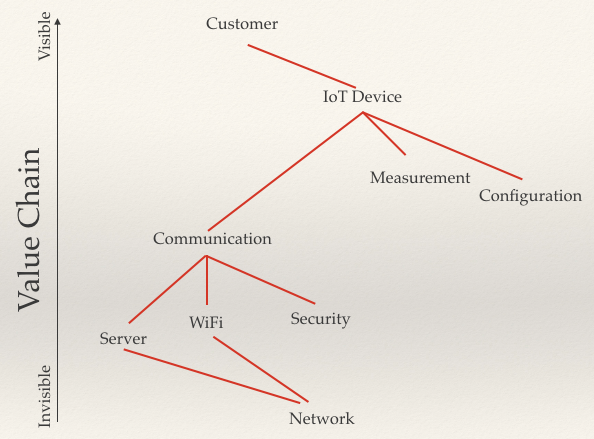 In the above image, the Customer “needs” an IoT Device. But from there we start getting into some interesting things. The IoT Device needs ways of measuring the weather, configuring the device, and communicating the measurements. In turn, communicating the measurements requires a server to talk to, WiFi to talk over, and security to make sure no one hacks in. Of course, both the Server and WiFi require a Network to talk over. At this point we’re only marginally better than the initial Google Map image we started with at the top. Sure we have a pretty picture, but it’s not telling us much. So let’s add the concept of motion – or in this case, evolution. Now we have something interesting. It turns out that there aren’t really any measurement devices out there for IoT devices, so it’s in its Genesis. The IoT Device – along with configuration and communication – all exist, but need to be custom built. However, the protocols for communication, including WiFi and Security, can all be purchased as Products, and both the servers and networks we’ll talk to are basically commodities we can just use. It’s interesting because we start to see where we can make a play based on who we are. 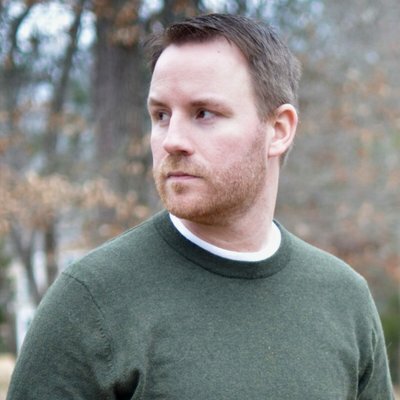 For example, one should never get into a land war in Asia, nor should one fight a battle for something that’s a utility unless you have the resources to back it up (For example, Verizon has products specifically for IoT networks making that probably not a good decision to break into as a startup). 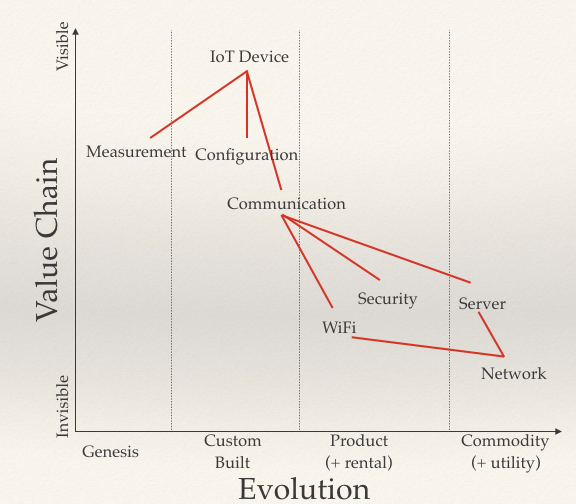 But the measurement, configuration and communication pieces will all eventually evolve into products. That means we can have a strategic advantage by figuring out how to lead and accelerate that evolution. So while measurement might not be something a lot of IoT projects would need, they almost all would need Configuration and Communication. How we make those plays depends upon many other elements, such as how they align with our business purpose, and how they fit into the capacity we have. But at least now we know how we can dazzle our CEO’s desire to have an IoT weather product – while still making it something that stands a chance of being a smart play into the space. If you’re interested in learning more, start with Simon’s introductory mapping post as well as his book in progress. You can also see the slides and videos from my talk. And if you’d like help understanding your organization, give us a shout! Another island in a lake on an island in a lake for you.